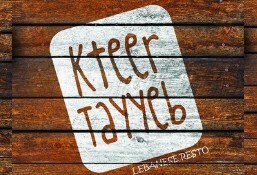 Kteer Tayyeb is currently closed for delivery and it will open at 09:00 AM today . 2 Spinach, 2 zaatar, and 2 cheese. Tomato sauce, cheese, pepperoni and oregano. Homemade chicken, garlic, pickles and French fries. Burger patty, tomatoes, coleslaw, onion, pickles, ketchup and mustard. Served with French fries. homemade sweetened yogurt with strawberry, banana, honey and granola. Plain croissant stuffed with knefe and a light taste of chocolate. Scrambled egg, Swiss cheese, mayo, tomatoes. Served with toasted bread and veggies. Bell pepper, mushroom, onion, tomatoes and side toasted bread. Scrambled egg with potato cubes, minced beef, bell pepper, onion and side Arabic bread. With exotic fruits, nutella or maple syrup. Light. Rocca, fresh mushroom, walnut, and Parmesan. Cucumber, rocca, mint, lettuce, fresh thyme and bakleh purslane. [Chef's Special] Light. Quinoa, chopped tomatoes, spring onions, parsley and special lemon oil dressing. Great selection of fresh seasonal veggies and pomegranate molasses dressing. Feta cheese, tomatoes, cucumber, lettuce, onion, olives, thyme, and green bell pepper. Light. Rocca, asparagus, cherry tomatoes, grilled halloumi. Light. Artichokes hearts, lettuce, summak and cherry tomatoes. Walnut, strawberry, dried cranberry, mango, sunflower seeds, and baby spinach with special fruity dressing. Marinated chicken, croutons, Romaine lettuce, and Parmesan. Iceberg, pasta, tuna, Swiss cheese, corn, olives, and tomatoes. Light. Kale leaves, quinoa and marinated grilled chicken breast, garnished with dried cranberry, roasted almond and sunflower seeds, served with balsamic vinegar dressing. Grilled beef slices, rocca, cherry tomatoes, fresh mushrooms, walnut and Parmesan cheese. Lettuce, corn, tomatoes, olives, smoked turkey, chicken breast, shredded carrot and Swiss cheese. Light. Iceberg, artichoke, rocca, capers and cream cheese. Tortillas, chicken, onion, green bell pepper and mozzarella cheese served with guacamole and sour cream. Chicken, pesto sauce, Parmesan cheese and pine seeds. With pomegranate and lemon sauce. With tomatoes and lemon juice. Tomato sauce, cheese, olives, mushroom and oregano. Tomato sauce, cheese, artichoke, asparagus, bell pepper, onion, corn, mushroom, olives and oregano. Tomato sauce, mixed cheese and fresh thyme. Tomato sauce, cheese with fresh thyme and soujouk. Chicken strips, onion, green pepper, mushroom, mozzarella cheese and BBQ sauce. Penne pasta, pesto sauce, grilled chicken strips, fresh cream, pine nuts and Parmesan cheese. Tagliatelle pasta, white sauce, grilled chicken strips, mushroom and Parmesan cheese. tomato sauce, minced beef and Parmesan cheese. With tomatoes, cucumber, mint, olives and olive oil. Grilled halloumi with rocca, tomatoes, cucumber, olives and pesto sauce. With tomatoes, cucumber, olives, olive oil and fresh thyme. With tomatoes, mint, olives and cucumber. With tomatoes, lettuce, pickles, corn and mayo sauce. Lite tuna mixed with lemon, onion and mint, pickles, lettuce and tomatoes served in cereal brown. Served in brown cereal bread. With rocca, capers, cream cheese, lemon dices. Served in brown cereal bread. Grilled steak slices, cherry tomatoes, rocca, fresh mushroom and light mustard sauce. Served in brown cereal bread. With tomatoes, lettuce, and citrus sauce. Served in brown cereal bread. Lettuce, onion, bell pepper, corn cheddar and avocado. Served with French fries. Mushroom, cheese, onion and mushroom sauce. Served with French fries. French fries, coleslaw, ketchup, pickles and garlic. Your choice of cauliflower, french fries, zucchini, eggplant with tahina sauce. French fries, pickles, ketchup, mustard, cheese and coleslaw. Served with French fries. Makanek, Hummos, pickles, tomatoes and pomegranate molases sauce. Served with French fries. Pickles, coleslaw, tomatoes and cocktail sauce and French fries. Served with French fries. Grilled chicken breast, avocado, mozzarella, cheddar, pickles and bbq sauce. Served with French fries. Chicken breast, tomatoes, lettuce, pickles, smoked turkey, Swiss cheese and mayo. Served with French fries. Lettuce, avocado, mozzarella cheese, grilled chicken with lemon garlic sauce. Served with French fries. Hummus, pickles, tomatoes and pomegranate, molasses sauce. Served with French fries. Marinated chicken, corn, cheese, lettuce, pickles and mayo. Chicken, French fries, pickles and garlic. Served with French fries. Homemade beef, parsley, onion, pickles, summak and tahina sauce. Served with French fries. Beef, tomatoes, lettuce, pickles, smoked turkey, Swiss cheese and mayo. Served with French fries. Grilled beef slices mixed with green bell pepper, onion, mozzarella and mayo. Served with French fries. Kafta meat, hummus, pickles, onion, summak and parsley. Served with French fries. Soujouk meat, pickles and tomatoes. Served with French fries. Roast beef, tomatoes, lettuce, mayo corn and pickles. Served with French fries. Grilled chicken cubes, french fries, pickles, garlic and coleslaw. Served with French fries. Veal cubes, hummus and cucumber pickles. Falafel, parsley, tomatoes, turnip pickles and tahina sauce. French fries, coleslaw salad, cucumber pickles, tomatoes and garlic. Fried cauliflower, cucumber pickles, tomatoes. Served with tahina sauce. Fried cauliflower, baby marrow and eggplant, cucumber pickles, tomatoes. Served with tahina sauce. Chicken shawarma, cucumber pickles, French fries, garlic paste. Served in markouk bread. Grilled chicken, pickles, garlic paste, and French fries. Grilled chicken cubes, garlic paste and pickles. Arabic sausage, hummus, cucumber pickles, and tomatoes. Arabic spicy sausage, hummus and cucumber pickles. Meat shawarma, parsley, onion, sumac, sesame paste, tomatoes, french fries. Served in markouk bread. Kabab, hummus and cucumber pickles. Gravy sauce, sauteed onion, mushroom and Swiss cheese. Served with French fries. Soujouk patty, egg patty, lettuce, tomatoes, mayo and pickles. Served with French fries. Grilled chicken breast, lettuce, tomatoes, pickles and garlic mayo sauce. Served with French fries. Beef patty, lettuce, tomatoes, grilled onion, grilled green pepper, Cheddar cheese, jalapenos and Mexican sauce. Served with French fries. Beef patty, fried mozzarella cheese, pickles, lettuce, tomatoes and cocktail sauce. Served with French fries. Beef patty, grilled onion, tomatoes, iceberg, pickles, chips, mushroom sauteed and BBQ sauce. Served with French fries.